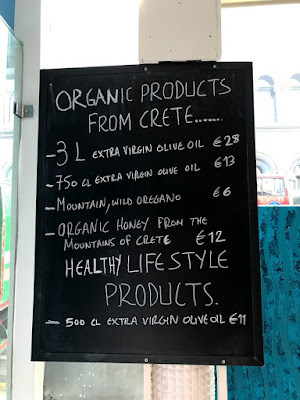 During my brief visit to Dublin at the end of last week, I was hoping to have lunch in one of my favourite Greek restaurants in the city centre. 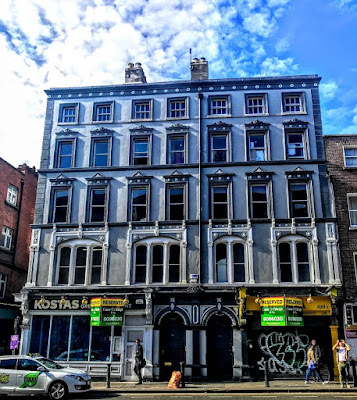 But when I arrived at Kostas on Dame Street, I found out, sadly, that Kostas has closed and the whole building has been vacated and refurbished, so that this block is now on the market to rent as a ready-made hotel. Yet, the whole building at No 68-70 Dame Street is one of the more eye-catching buildings on this street. Dame Street became one of the principal streets in the centre of Dublin in the 18th century. It leads from Trinity College Dublin and the former Parliament House, now the Bank of Ireland, on College Green, to City Hall and Dublin Castle, and became the ceremonial route for parades between Parliament and the Castle. Dame Street was widened and remodelled by Samuel Sproule and Charles Tarrant for the Wide Street Commissioners in the late 18th century, and the street now continues through Lord Edward Street to the east end of Christ Church Cathedral and the Chapter House. 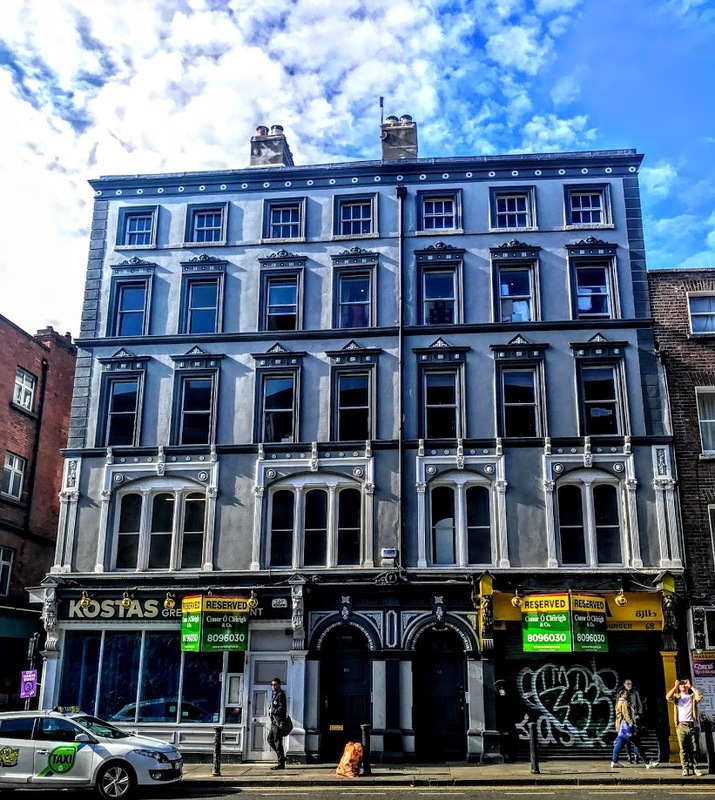 No 68-70 Dame Street is a large Victorian stuccoed block with lion-head-and-paw console brackets. It presents a cohesive and balanced composition that typifies the best of early-Victorian architectural design. Although I have not yet identified the architect, the high-calibre artistry and the execution of the classical details on the building can be seen in the stuccowork, the render detailing, the shopfronts and well-composed doorcases. These all add to the prominent location of this building on the north side of Dame Street, on the corner of Dame Street and Sycamore Street, right beside the Olympia Theatre and opposite one of the entrances to Dublin Castle. Although visibly one building, this is a corner-sited pair of three-bay and four-bay five-storey over basement commercial buildings, built on this corner site, with two shopfronts on the front (south) side, a shopfront on the west side, facing Sycamore Street and the Olympia Theatre, and a bow to the rear or north elevation. 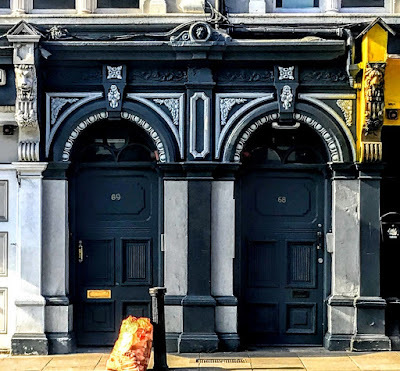 On the ground floor, the masonry and timber shopfronts have Doric pilasters supporting fluted console brackets that have lions’ head detail and flanking timber fascia with egg-and-dart moulding and moulded cornices. The square-headed shopfront windows have timber mullions, raised carved timber stall risers and matching timber panelled doors. The paired round-headed door openings have carved timber panelled doors flanked by timber Doric pilasters supporting egg-and-dart mouldings to the arch and with a carved keystone over the original fanlight with rounded glazing panels, floral motifs to the spandrels and frieze, and all surmounted with a carved timber cornice that has lions’ heads on the scrolled finial. Also on the ground floor, the square-headed and round-headed windows have granite sills at the side (or west), with three-over-three pane, six-over-six pane and one-over-one pane timber sliding sash windows. There is also a timber-panelled door in the west side. There are cubed glass basement lights with bronze glazing bars inset on the granite paving on the Sycamore Street side of the building. The lined-and-ruled rendered wall at the front of the building has circular medallions at the rendered eaves course. On the first floor there are paired fluted Corinthian pilasters, surmounted by a decorative panel with a floral motif, and there rendered quoins on the second and third floors. The segmental-headed window openings on the first floor are paired on the east bays and are tripartite on the west bays. They have fluted mullions, set within segmental-headed moulded window surrounds. They are flanked by fluted Corinthian pilasters supporting square-headed hood moulding with acanthus leaf keystones and lions head medallions to the spandrels. There are square-headed window openings with moulded architraves on the upper floors, and these have moulded render entablatures on the second and third floors. There they have pediment details and geometric medallions, and string courses form continuous sill courses. There are console brackets on the second floor, with infills of circular medallions. There are three-over-three pane and one-over-one pane timber sliding sash windows. There are lined-and-ruled rendered walls at the east and west side, and smooth rendered walls at the rear. There is an L-plan hipped slate roof, and a pitched roof to the rear, with rendered chimneystacks, hidden behind the rendered parapet with cut granite coping. For many years, the corner restaurant on the ground was Beirut Express, before it became Kostas. I was to find Kostas has closed. It served authentic Greek food, organic Cretan produce, real Greek raki and homemade baklava. 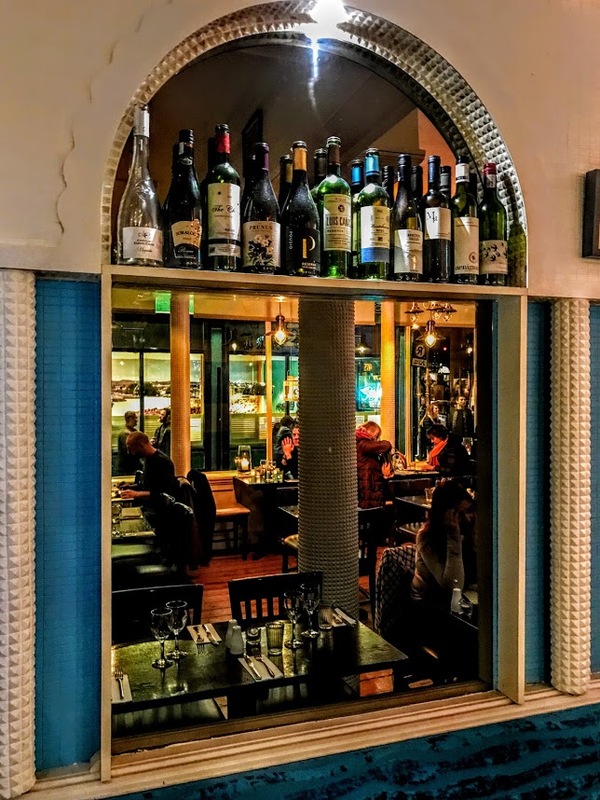 Hopefully, the former owners open a new restaurant in Dublin soon.